Escorted by the man who had checked in my luggage, plus an airport security lady, we walked down a set of stairs, made a left once we reached the tarmac, and finally a second left turn took us into the underbelly of Entebbe International Airport. The luggage conveyor belts under the airport were still. The holes in some places and random bits of broken machinery in others testified to years of neglect in this part of the airport, normally hidden from the view of the thousands of passengers flying in and out of this otherwise shiny, modern airport every day. Ahead and to the left, a huddle of baggage handlers in yellow reflective overalls stood and crouched in various poses, some with arms crossed, others arms akimbo, as one might expect dancers in a Broadway musical to surround the star actor at the end of an action-packed song and dance number. Except, in this case, the star actor was my backpack. Into the centre of the circle of men I strode, attempting my best to exude friendly, nonthreatening confidence. Sure enough, something was very much vibrating in my bag: the electric razor I use to shave my head. Having not shaved my head in a month, I’d completely forgotten it was even in my bag and, sure enough, it had somehow switched itself on. Aside from that, the flights from Uganda to Switzerland went unbelievably smoothly. 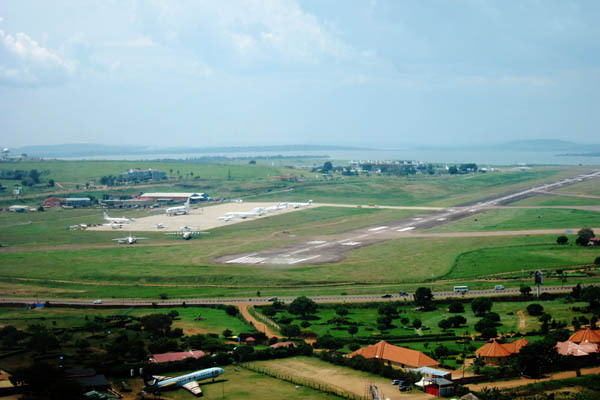 This entry was posted in Africa, Travel, Uganda and tagged Airport Adventures, Entebbe International Airport.